After a great show the final polling consolidated figured have been released by the Election commission and one must say we have flayed well in this when compared to last time. This time in 2014, 68.52% of the voters voted in the election. Whereas in 2009 it was 54.75% and in 2004 it was 66.10%. 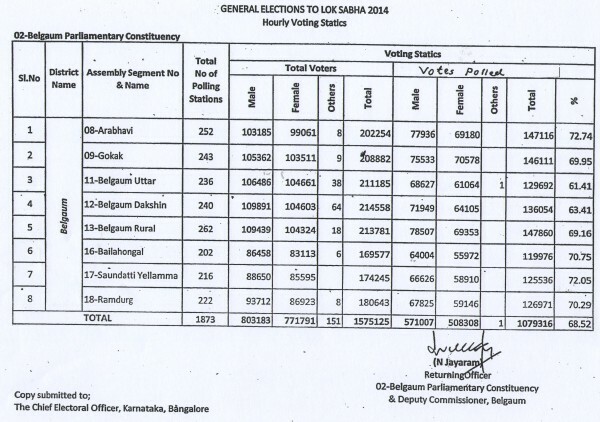 The least voting happened in Belgaum North 61.41% while the highest was in 72.74% at Arbhavi. Belgaum south saw a 63.41% turnout whereas Belgaum Rural saw 69.16% turnout. The male voters outnumbered the Female voters this time, with 571007 males voted while 508308 females voted. In Belgaum North, south and rural the men outnumbered the women voters.